For the last 5 weeks we have been almost constantly on the go with something touristy on the itinerary for every day. Today we found ourselves with an empty day having decided to skip the planned day-trip to Leipzig. When we checked into this apartment our host Theodor (via a translation app on his phone) suggested we go and see the Blaues Wunder Brucke and ride the Seilbahn. Adding to our tally of local transport we caught bus 61 to Loschwitz in time for a late morning tea at the locally famous Kaffee Wippler . It’s a 25min trip out through the Dresden burbs and you get a great look at local life as the bus wends its way past the Tiergarten (far end of the Grosse Garten) and through suburban streets. This part of Dresden appears by the age of the houses to have avoided the destruction rained upon the inner city. 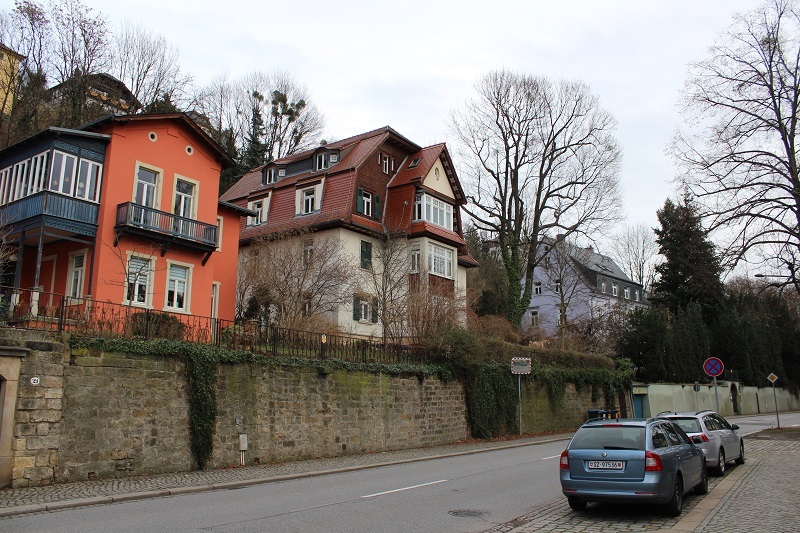 The 18th century houses sit side by side with those from the 20’s and those of the DDR era. Rather than head straight up the hill on the Standseilbahn (funicular) we took a wander round the local streets. It was really cool to see that in this part of Dresden, little plaques are attached to the front fences of every home and lists the date of their building. Many homes also indicated the date the houses had been renovated. What a cool way to present a home’s history! Our wander took us down to the banks of the Elbe and the Blaues Wunder. It’s an impressive bridge to look at now but in 1893 when it was built it was a wonder – hence the name. It is a 280m long cantilever bridge, meaning it has no piers in the river. Heading back into the centre of town we caught the Seilbahn (Funicular) up to the hilltop enclave of Weisser Hirsch. The railway was opened in 1895, originally run by a steam engine before being converted to electricity in 1910. During the bombing of Dresden in 1945, the lower station of the funicular was destroyed. Fortunately the cars had been moved for safety into the line's tunnels and survived. Our original idea had been to catch the Sielbahn up and catch the nearby Schwebebahn ( a hanging monoral – and with a build date of 1901 one of the oldest) down, but from our watching at our coffee stop it looked like the Schwebebahn wasn’t working today. 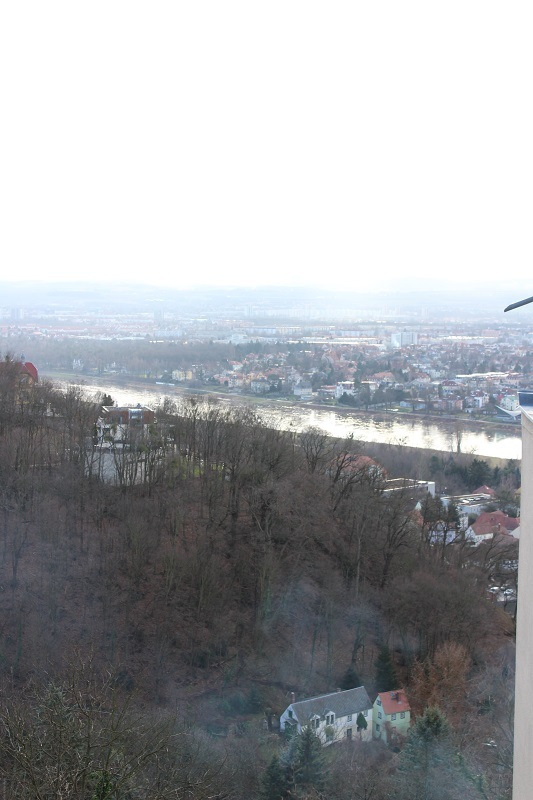 We bought a return ticket on the Seilbahn and having seen the steepness of the incline – I’m very glad we did. Even on a cloudy day, the views are amazing. Built right on the edge beside the Seilbahn station the lovely Villa Luisa would have sensational views over the Elbe and Dresden. Complete with Deer Head ... maybe a hunting lodge in a previous life? We drooled our way into the town centre and noticed a fairly large wooded area across the road – with lots of people heading in. 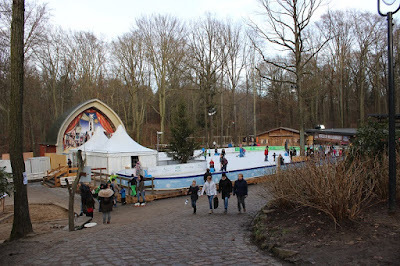 Following out of curiosity, we walked a couple of hundred metres into the ‘bush’ only to come across a skating rink! 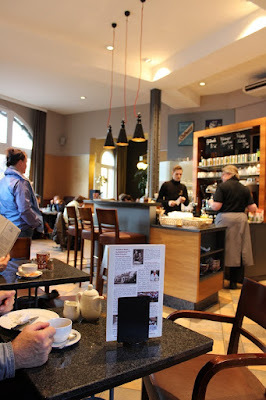 We headed back down to Loschwitz and found a little bakery where we bought a couple of ham & salad rolls for a late lunch before taking the bus back to our flat at Strahlen. It was really nice just to have a really slow day and take it easy. Dinner tonight is ham, cheese, salami etc on biscuits or pumpernickel bread and a beer or two before packing for the next leg of our trip – we’re off to Berlin in the morning. Wow Erfurt... what a surprise!